NETWORK FINALS: CHICAGO PD rose 0.1 in final numbers, but THE X-FILES premiere lost the same. CABLE HIGHLIGHTS: ESPN’s NBA doubleheader led Wednesday cable at 1.29 (for Cleveland vs. Boston)/0.81 (Lakers vs. Oklahoma City). VH1’s BLACK INK CREW ticked up to 0.74. On History, VIKINGS rebounded by 0.14 from its holiday week episode to 0.52, and KNIGHTFALL was up 0.05 to 0.24. Bravo’s REAL HOUSEWIVES OF NEW JERSEY returned at 0.51. It was a big night for one end of cable news, and MSNBC’s RACHEL MADDOW SHOW dominated the field at 0.40/0.62/3.2M, above Fox News’s HANNITY at 0.28/0.49/2.8M, and CNN’s ERIN BURNETT OUTFRONT at 0.28/0.35/1.1M. Freeform’s GROWN-ISH had a solid premiere with back-to-back episodes at 0.40/0.39, and not surprisingly they were particularly strong in the F12-34 demo with 0.55/0.52, behind only BLACK INK CREW for the night. 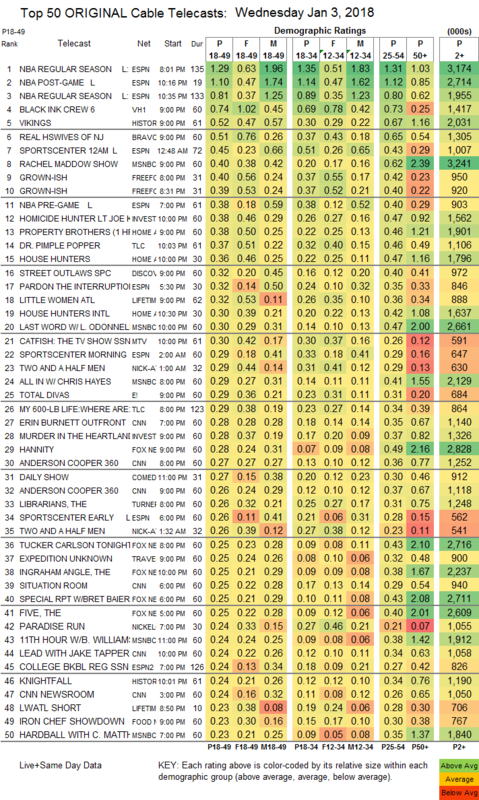 On ID, HOMICIDE HUNTER returned at 0.38, and MURDER IN THE HEARTLAND was down 0.09 to 0.28. On HGTV, PROPERTY BROTHERS gained 0.38, with HOUSE HUNTERS up 0.07 to 0.36, and HOUSE HUNTERS INTL up 0.03 to 0.30. It’s our obligation to report that TLC’s DR PIMPLE POPPER premiered at a perky 0.37, after MY 600-LB LIFE returned at 0.29. Discovery aired a STREET OUTLAWS special at 0.32, then FAST N LOUD at 0.19. On Lifetime, LITTLE WOMEN ATLANTA climbed 0.03 to 0.32, and TERRA’S BIG HOUSE was down 0.02 to 0.22. MTV’s CATFISH jumped 0.11 to 0.30. 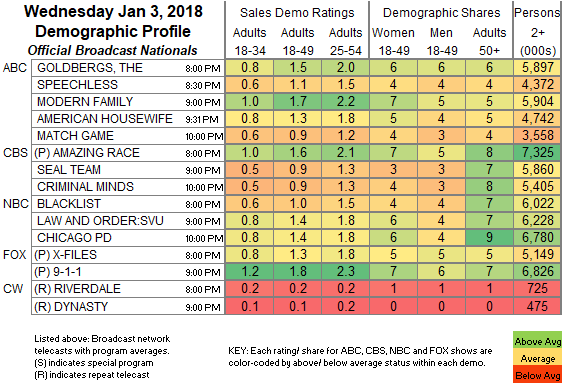 On E!, TOTAL DIVAS was at 0.29. TNT’s THE LIBRARIANS fell to 0.26 from last week’s 0.37/0.31. On Food Network, IRON CHEF SHOWDOWN lost 0.03 to 0.23, and IRON CHEF: BEHIND THE BATTLE ticked down to 0.22. A&E’s OZZY & JACK’S WORLD DETOUR ticked up to 0.21.